I seriously can’t believe what passes for oatmeal in America. People are either trudging their way through some tasteless, goopy, instant crap or they’re eating some other packaged version because it’s “low in fat and cholesterol.” Both usually contain “natural flavors” which is food industry lingo for artificial flavors as well as tons of sugar and other chemicals. 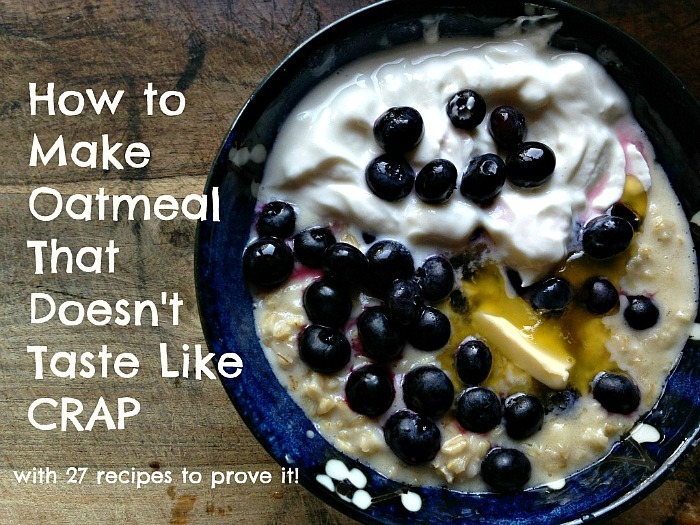 It is NOT HARD to make oatmeal that doesn’t taste like crap! 1. Purchase oatmeal in whole form as either rolled oats or steel-cut and soak overnight. The soaking process does a few things. First, it dramatically reduces the cooking time. It’s actually a healthy version of instant oatmeal! Simply simmer for a few minutes (the steel-cut oats will take a little longer) in the morning and add more water if necessary. Second, it softens the oats and makes them naturally creamy without being overly gloppy like most instant versions and overly chewy like most unsoaked versions. And finally, the soaking process makes the oats more nutritious and digestible. To soak oats, add one part oats to two parts water and add an acidic medium such as a teaspoon of yogurt or whey or a squeeze of lemon. This acidic medium will break down phytic acid, an anti-nutrient in the outer shell of grains that can negatively impact digestion. 2. Add healthy fats. Imagine that! Yes, healthy fats make oatmeal more palatable and also more digestible. I can’t believe any human being could actually ingest a bowl of oatmeal without fat. To me it just seems, well…disgusting. Then why do millions of Americans make oatmeal with skim milk or low-fat yogurt? Because of that outdated, thoroughly debunked idea that fat and cholesterol cause disease. Stupid lipid hypothesis. What a scam! Add a glorious, heaping tablespoon of butter, a dollop or two of cream, coconut oil or coconut flakes and top with whole milk yogurt. Add in some almonds, walnuts or any nuts or seeds of your choice. 3. Add sweetness. Any fruit and/or a dollop of raw honey or maple syrup. 4. Add sea salt to taste. I love the combination of salty, creamy and sweet. It makes oatmeal tasty heavenly. 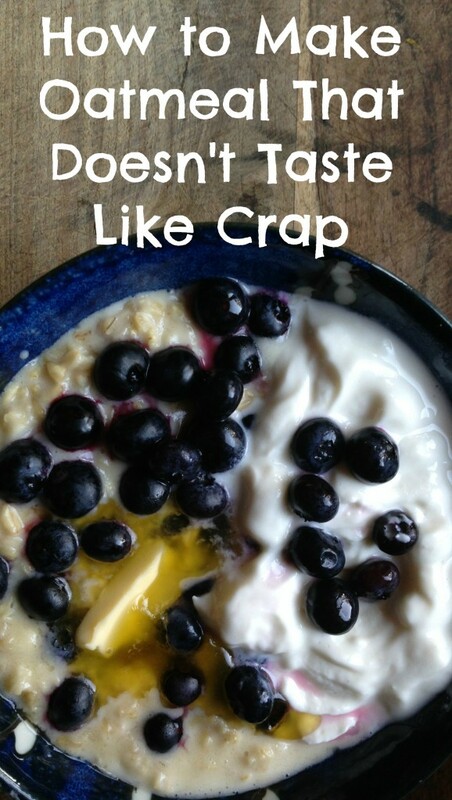 This is my favorite oatmeal recipe with FULL FAT butter, cream and yogurt as well as fresh blueberries, honey and sea salt. It is a heavenly combination! Add in blueberries if frozen and mix well to thaw. If my version doesn’t float your boat, well, I called on my real food buddies to share their best oatmeal recipes with me. This list proves that you can make oatmeal in a wide variety of ways that please all taste buds! Soaked Oatmeal Breakfast by Oh Lardy!